In May 2018, the FT communicated changes to its Privacy and Cookies Policies to align with new data regulations. We often get questions from customers on how these policies apply to organisations with FT Group Subscriptions. 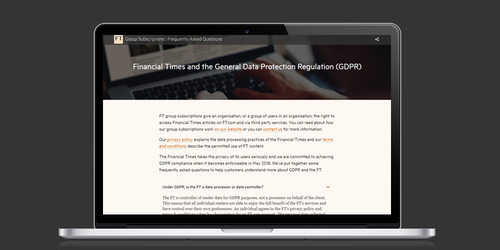 GDPR governs how organisations collect, manage and protect personal information, including the user data held on FT Group Subscriptions purchased by organisations. Our FAQs on GDPR can be found here. An important part of the FT’s effort to maintain GDPR compliance is ensuring individuals can easily manage their communication preferences and FT.com settings that determine the type of communication they receive from the FT. The preferences provided by individuals on an FT Group Subscription supercede policies agreed with the customer organisation or employer. This category of communication includes the release of new special reports, recommended reads and the latest feature announcements. For example, we send personalised emails when a new subscriber joins a corporate licence to explain key features that are available to them on FT.com such as myFT. This category of communication includes exclusive personalised event invitations, carefully-curated offers and promotions from the Financial Times. For example, we send exclusive invitations to subscribers for events in their region that are hosted by the Financial Times on topics such as ‘How to talk about money at work’. Service messages are sent to a reader when an important update is relevant to them and will impact their subscription or usage of FT.com. Therefore, users are not able to opt out of these essential messages. For example, we send emails when we update our policies so that all subscribers are aware of the change made and how it impacts them. Other service messages include updates to FT.com, new features or tools launched, or degradations in service. Within ‘Top stories & Features’ and ‘Invites & offers from the FT’, readers can manage their contact preferences by each channel - email, phone and post, separately. Or they can choose to opt out of all communications, except service messages. Users can review and amend their personal contact preferences at https://www.ft.com/myft/alerts/.